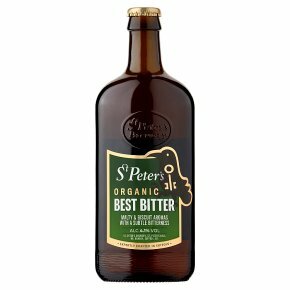 Organic malted barley is used to make the mash for this excellent beer from the St Peter's Brewery in Suffolk. To provide the distinctive fully hopped character, organic hops are added. This is absolutely perfect paired alongside smoked or cured meats, or to partner a traditional picnic spread. Organic.Organically grown Optic malted barley and 1st Gold hops are used to create a superb, refreshing, full-bodied bitter. Brewed with skill and patience in one of Britain's finest small breweries.